(Newser) – A mass of small volcanic rocks nearly the size of Belgium has been discovered floating off the coast of New Zealand. The stretch of golf-ball-size pumice rocks was first spotted this week by a New Zealand air force plane about 620 miles northeast of Auckland. The rocks stretch for about 10,000 square miles. 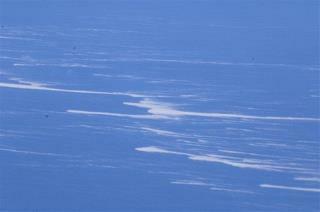 Naval Lt. Tim Oscar says the rocks appeared a brilliant white under a spotlight, like a giant ice shelf. He says it's the "weirdest thing" he's seen in 18 years at sea. More evidence of global warming. Ours will be the last generation.